A dolphin show was disrupted over the weekend by animal activists as they reached a new low, by jumping into the pool at the beginning of the show. Audiences at the packed show booed as the activists jumped in the tanks and held up signs. Dolphins were kept away from the activists and out of harms way, and no one was hurt. That also brings up a huge question, what effects does having outsiders in the dolphin pool do to the dolphins? While trainers are in the water, they undergo very strict methods that keeps germs and other bacteria from the outside world out. Is it possible that by protesting to “save” the animals, that the activists are causing actual harm to them? Loro Parque is at the center of controversy after booking agent, Thomas Cook announced that they would be ceasing tickets and tours to not only Loro Parque, but also SeaWorld. Thomas Cook is partially owned by Fosun, who also owns facilities that keep dolphins. 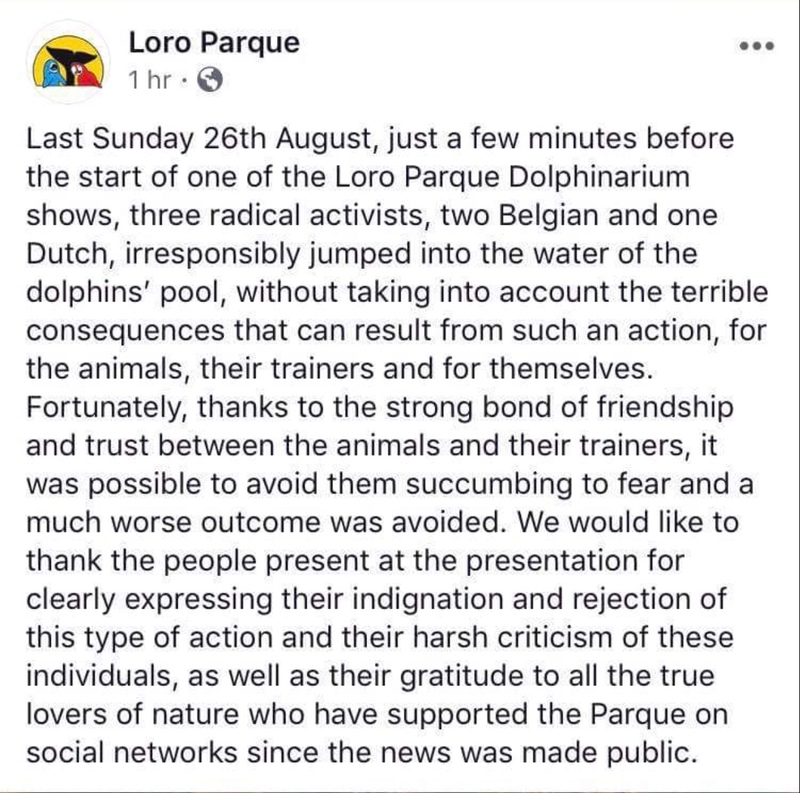 Loro Parque has posted an update, and just as we had said, the biggest worry is the safety of the animals and the idiots who decided to jump in the tanks. Things like this do absolutely nothing for the animals, and in fact could be very harmful to not just the animals but also the protesters.